(Kitco News) - Oh, Canada! The vast northern country holds a multitude of metals and gold is amongst the most prevalent. 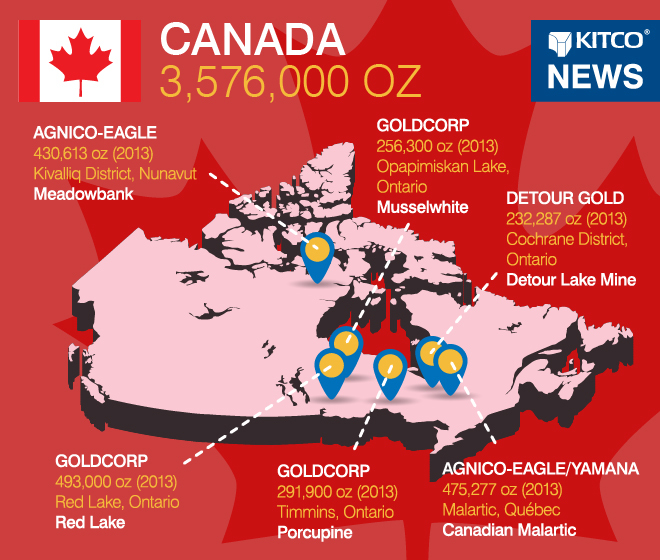 The country’s largest gold mine is Agnico Eagles Mines Ltd.’s (TSX:AEM)(NYSE:AEM) and Yamana Gold Inc.’s (TSX:YRI)(NYSE:AUY) Canadian Malartic mine, located in Quebec. An entertaining bidding war for the mine took place earlier this year, with Canadian dominant gold producer Goldcorp Inc. (TSX:G)(NYSE:GG) missing out on adding to its Canadian portfolio. Don’t feel too bad for Goldcorp as the company currently operates its large Red Lake operations, made of two mines as well as the Porcupine operations, also made up of two mines. Also on the docket for Goldcorp are its Cochenour and Éléonore mines, both scheduled to come online toward the end of 2014. Cochenour, in the Red Lake mining district of Ontario, is expected to produce between 200,000 and 250,000 ounces of gold annually. Éléonore, located in northern Quebec, is expected to ramp up to roughly 600,000 ounces of gold annually once it hits full steam. Agnico Eagle is also a firm player in the country with its large Meadowbank mine as well as its La Ronde and Goldex mines in Quebec. Canada stands as the seventh-largest gold producing nation in the world.